It seems like the weeks just speed by. Well, it slows down during the week but speeds up on the weekend and next thing you know, today is that same day of the week that seemed like it was only yesterday. I started out the morning by getting a flu shot at Kaiser. I took a book with me (the one about Barney and Betty Hill being abducted onto a UFO), expecting to have a long wait in line but to Kaiser's credit, the line moved rapidly. Also to their credit, they really are practicing preventative medicine because once out of the tent where the shots were administered, other staff members herded me into another line to be checked to see if all my shots and vaccinations were up to date. To my credit, they were. I think that's great that Kaiser takes a proactive stance towards keeping its members healthy. After all, it benefits them in the long run as well in the form of reduced care costs. I hadn't expected to finish that early so that meant I wound up at Costco early as well, which gave me time to read more of that book. There weren't that many people in the store today and I saw plenty of parking spaces when I left - not a good sign. Well, good for me since I didn't have to put up with crowds, but bad for Costco. I've just got a couple of pictures today since everything else was repeat business. 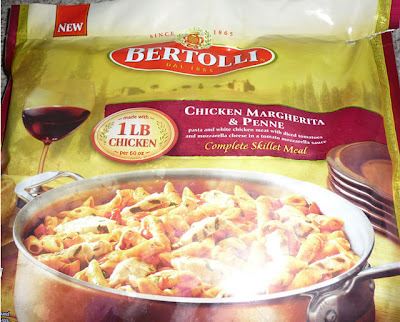 The latest coupon book had a $3.50 off coupon for this pasta dish so I thought I'd give it a try. And I had to pick up a prescription for my mom. That price is for a 3-month supply, 90 pills. 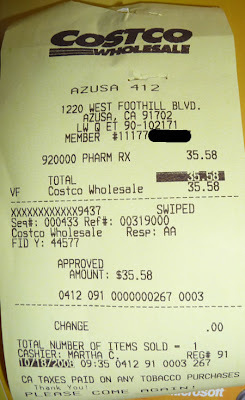 Compare that to what she was being charged by the pharmacy at her care facility: $3.99 per pill! That's right - more than 10x as much. I know the other pharmacy has higher overhead because they operate on a 24/7 basis and don't have the purchasing power Costco has, but 10x?? By the way, stupid me finally figured out that I've been using the wrong American Express card at Costco. I was wondering why do I not get that 1% cash back on my Costco purchases as well as an even higher 3% on gasoline? Then I found out I don't have the "True Earnings" American Express card. I thought the card I had (which, by the way was issued in conjunction with Costco) and the True Earnings card were one in the same but apparently not. This week I submitted an application for the True Earnings card. All the spending I've done so far has qualified me for some measly little rebate on my current card because it is tiered - up to $X of spending, the rebate is only something like .000000004 of the total dollars spent until you get to some astronomical $Y balance, at which time it goes up about another .0000001 until you reach space the final tier, and at $Z are at the millionaire's 1% level. It's sort of like playing the board game Life. Then I went to see my folks and dropped off the prescription. They had just returned from an exercise session. I didn't realize how paranoid my dad is. He started asking me about the bill for the facilities (it's sent to me and I handle paying it) and whether or not they itemize everything and how he suspects they are trying to pad the bill with a bunch of services that either he never asked for or never received. "Here's an example," he told me. "The other day they had me go downstairs because they said the doctor wanted to examine my feet." That sounded reasonable to me so I just waited for him to continue. "And do you know what they did?" "They didn't want to look at my feet. They cut my toenails!" "Oh." Well I suppose since they don't allow them to keep nail clippers or scissors with them, someone has to take care of that task. At least they didn't try and make him believe he could fall asleep if he held onto his big toe. "That's the kind of stuff they do around here." He looked at me, waiting for me to have the same astonished look as he did. I just shrugged. "I bet they're going to charge me for that. It's just another way to get money out of me. Did you see that on the bill?" "No, but the bill wouldn't have any October services on it," I said. "When did they do this? Last month or this month?" Then he pulled out a mini-sized spiral notebook to consult. There were all kinds of notes written in there. "October 12. They did it October 12 at 9:30 a.m."
"Well, I'll have to check next month's bill to see if they charged you for it," I told him. Then I noticed he had a little reminder note about getting my uncle (his brother) Hiroshi's phone number from the address book at the house. "Did you get the number from Jessie?" I asked him. My sister had called and left a message to give to him. "Yes, but I don't think this is the right number. I called it a couple of times and this voice comes on that tells me something like, like, well I can't remember but they say something like, 'I'm not in right now' and stuff like that. Sort of like it's a business or something. I bet they wrote down the wrong number. See, it's easy to just get one of the numbers wrong, and there you are, it's not the right number anymore." Finally I ascertained whether or not he had left a message. No, he hadn't. "Well how do you know it's the wrong number if you didn't leave a message? Maybe that's the right number but how's Hiroshi going to know you called if you don't leave that message for him?" "Naw, that couldn't be him. That voice was in good English. Like it was a high class white man talking." I started to tell him that could be the phone company's own voice mail service but thought I'd just leave it like that. "Just check with Jessie when she comes here tomorrow," I said. "I'm going to do that. Then if it turns out that's the right number, then I'll leave a message." I asked him when was the last time he had spoken to my uncle/his brother. "Oh, it's been a long time," he said. "I don't like calling over there because his wife always answers the phone and she's kind of, kind of-" and he was circling his finger around his head "-kind of loopy. She's not all there." "One time she called me up and was all upset because she thought I called there and said, 'Hiroshi Hiroshi Hiroshi Hiroshi' and then hung up the phone real fast. She asked why did I call and do that? I said, 'what makes you think I did that? Why would I do something like that??'" "She said, 'well it sounded like your voice so I thought it was you.' I told her why would I call and say 'Hiroshi Hiroshi Hiroshi Hiroshi' like that real fast and then hang up? And she kept insisting it was me because it sounded like me. That's why I never want to call there because she's going to answer the phone. I know it." Meanwhile my mom sat there patiently, just listening. Then it got to be their lunchtime so I said goodbye to mom and dad, then headed out to run some more errands. One of the errands was to the bank, where I had to wait to talk to one of the accounts people. While I sat there, I watched the fish in the saltwater aquarium against the wall. There were some really colorful ones, including jellyfish so it must have been a salt water tank. While I sat there watching the fish swim, I wondered if they realized they were in a box and knew the difference between this and being in the open sea. Were they aware that they were hemmed in by the glass sides of the tank and that the decorations were the same day in and day out? They were well-cared for, that's for sure, and didn't have to worry about any of the perils of the deep sea. But I wondered if they missed their freedom.